What Types of Values Enter Simulation Validation and What Are Their Roles? 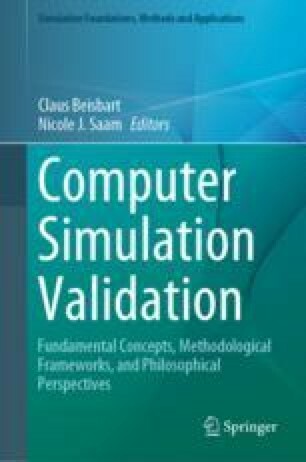 Based on a framework that distinguishes several types, roles and functions of values in science, we discuss legitimate applications of values in the validation of computer simulations. We argue that, first, epistemic values, such as empirical accuracy and coherence with background knowledge, have the role to assess the credibility of simulation results, whereas, second, cognitive values, such as comprehensiveness of a conceptual model or easy handling of a numerical model, have the role to assess the usefulness of a model for investigating a hypothesis. In both roles, values perform what we call first-order functions. In addition, cognitive values may also serve an auxiliary function by facilitating the assessment of credibility. As for a third type of values, i.e. social values, their legitimate role consists in specifying and weighing epistemic and cognitive values with respect to practical uses of a simulation, which is considered a second-order function. Rational intersubjective agreement on how to specify and weigh the different values is supposed to ensure objectivity in simulation validation. We thank Claus Beisbart, Johannes Lenhard and Nicole J. Saam for valuable comments and suggestions to improve this manuscript. Goldman, A., & Blanchard, T. (2016). Social Epistemology. In E. N. Zalta (Ed. ), The Stanford Encyclopedia of Philosophy (Winter 2016 Edition), https://plato.stanford.edu/archives/win2016/entries/epistemology-social/. Mastrandrea, M. D., Field, C. B., Stocker, T. F., Edenhofer, O., Ebi, K. L., Frame, D. J., Held, H., Kriegler, E., Mach, K. J., Ebi, K. L., Matschoss P. R., Plattner, G.-K., Yohe, G. W., & Zwiers, F. W. (2010). Guidance note for lead authors of the IPCC Fitfth Assessment Report on consistent treatment of uncertainties. Intergovernmental Panel on Climate Change (IPCC). Retrieved from http://www.ipcc.ch. Winsberg, E. (2015). Computer simulations in science. In E. Edward (Ed. ), The Stanford Encyclopedia of Philosophy (Summer 2015 Edition). Retrieved from http://plato.stanford.edu/entries/simulations-science/.